Back in 2008, del Torro had a great idea for a TV show and he began pitching it around town. Unable to gain any support or networks willing to make the show, his agent suggested turning the property into a book. Teaming up with author Chuck Hogan (who wrote the book 'The Town' with Ben Affleck was based on) the duo created The Strain trilogy. Three books that tell the epic tale of a vampire parasite that begins infecting the residents of NYC. The vampire story then takes a turn towards the pandemic, as the virus begins to rapidly spread and only a group of ragtag scientists and fighters can try to bring it to an end. 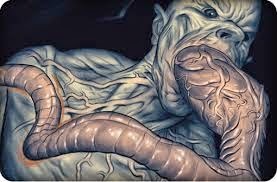 The vampires and the parasite that infects them are vastly different than the way vampires have been displayed and characterized in the past. They feature many of the creep-tastic qualities that have become a staple of del Torro's work. 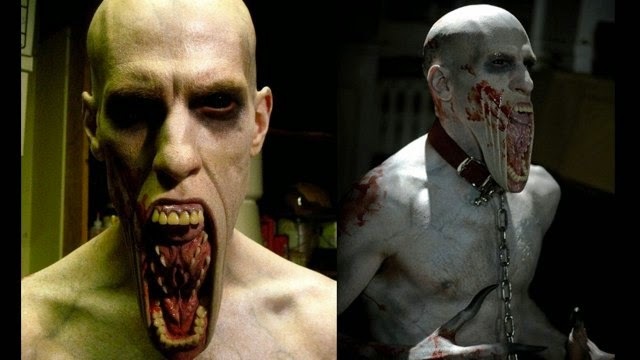 The vampires have a 6 foot 'stinger' proboscis that is under their tongue. It can be used to 'infect' people from afar... eliminating the need for the vamps to get up close to their victims. The virus itself is also transmitted via 'worms', small creatures that are either introduced to the victims bloodstream via a bite or can invade a person through an open wound or cut. This makes the risk for infection even greater, as you not only have to avoid the actual vampires but microscopic organisms that could infect you as well. The first book was one of the best things I have ever read. Apparently FX felt the same way... and they finally gave the property a order for a TV series. The show will air on July 13th, and I for one could not be more excited.